Why Is It Important To Give A Clear Blog Post Description? To be on the first page of google search is important, but you have to add clear blog post description to make the visitors click it. This is why I often continue searching for a post to page two, three or maybe more even though the first page already gives match titles. As an internet daily users, I'm aware that title is never a guarantee of the match post. Naughty bloggers use SEO without responsibilities to chase for the first page. For them, it doesn't matter if the visitors feel disappointed as long as they have already clicked the page. So, what is the blog post description? Blog post description is your simple words to describe the main idea of your post, or we can call it a summary. It is important to make it simple because the function is to help the visitors get a glimpse of the whole story. When a visitor search using a keyword, she will read the result very quickly and only stop for a second on the interesting title. The moment she stops on one title, it's the time for the description to attract her. With a short and clear description, she will decide to click it easily. In a good blogging, the most important thing is not only to get clicked, but it's to get clicked and make the visitors find what they search. They probably don't agree with the content, because blogging is a personal thought after all. But the correlation between keyword, title and content is a must. So, how to set a blog post description? I went to Jogja last weekend. So, what? Did you visit your grandma? Did you go to your cousin wedding? Give a specific summary. For example, Last week I went to Jogja and visit its wonderful beaches. Monday is a busy day. Yeah, everybody knows it. So? Give a specific topic that you want to deliver, such as "These 5 tips from my personal experience will help you to survive on the busy Mondays.". I want to tell a story. What story? Is your kitten missing? Do you have a new house? You can specify like this: I want to tell you about my new red kitchen. You can set the words from dashboard. I can only give you an example from blogger example because I don't use wordpress for my personal blog. But if you use wordpress, don't forget to have a good plugin which can synchronize all elements to get green light icon (SEO friendly). The plugin will help you to make a match description with the whole blogging element in your post. To me, post blog description is such a summary of the post. Love this...so important but sometimes forgotten.. However it is worth reading about Post Description. I am also still struggling with this one. Thanks for the valuable information. Jadi sebaiknya berbentuk kalimat...bukan keyword. Begitu? 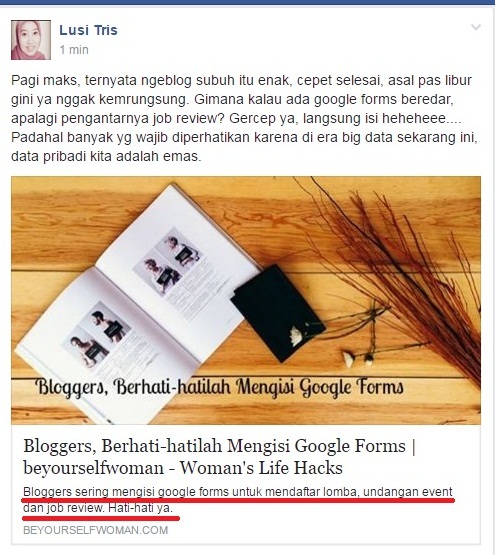 mba... kok di dashboard blogger saya ga ada isian 'search description' yah? In my WP, already installed some plugin SEO which is show : title, description. But, too bad, I dont know what's the function of those coloumn. Just, a few post I fill that description. Thanks a lot mak! This post really useful to me, now I know that every post I must fill description coloumn. Love this post. Many blogger missing opportunities due to this description. Simple yet actually powerful and must do thing when blogging. Thank you for sharing Mbak. And love your quote - But the correlation between keyword, title and content is a must.